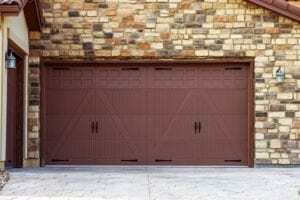 If you need a new or replacement garage door, you have a chance to bring an amazing touch to the look of your home. This quick lesson in style will introduce you to the standards in garage doors, enhancing your ability to choose a door that you will appreciate for many years. Aluminum. Aluminum doors offer the highest quality in weather resistance. They never rust, swell or warp, and they are extremely light, which adds considerably to the lifespan of the opener and tracks. They come in a range of colors and styles, but they may feel out of place in extremely traditional homes. Styles that have risen in the last 50 to 60 years look best with aluminum. Steel. Stylistically, steel parallels aluminum. The trade-offs come from steel being heavier, and thus more resistant to bangs and dents. Conversely, steel can suffer from rust if the finish is scratched or dented. It is also heavier than aluminum, which can offer more security. Wood. Wood is the traditional option. Paneling and banding enable for far more style choices than metals, and the natural color finishes can add an element of charm that is unique to wood doors. They do come at a price, and that cost is maintenance. While metal and synthetic doors require no upkeep, wood needs periodic staining or sealing to withstand the weather. Fiberglass. Post 1970, the prominence of fiberglass doors rose quickly. They are reasonably tough, very light and 100 percent weatherproof. They also sit nicely between metals and wood in average price. The major drawback to fiberglass is that it is vulnerable to collisions. If fiberglass is punctured, there is no repair option, only replacement. Vinyl. The final synthetic option is vinyl. It’s considered the most kid-friendly choice, as it is extremely durable. It’s another minimal maintenance option. Vinyl looks best on modern designs. Victorian/Colonial. The ultimate in traditional houses, these homes are best matched with paneled wood, divided-light windows, and decorative hardware. Edwardian. Still, in the traditional vein, Edwardian homes typically utilized raised panels, an arched top or divided windows. There will be some similarities between Edwardian and Victorian styles, and both tend to favor wood doors. Ranch. Getting into more 20th Century American style, ranch-style homes take the less is more approach. Plain finishes and simple slats or banding make a strong statement without flourish. This opens options with all of the materials. Contemporary. Most subdivisions built since 1950 have contemporary styles. The name of the game here is creativity. Frosted or pebbled glass windows, v-ribbed banding and a whole bunch of other touches let you put your stamp on your garage door. The sky’s the limit, so pick the material you like most and have fun.